This past year has been full of news stories on bully related violence and desperation that started an important and overdue conversation in this country. I can’t possibly read every bit of coverage on these stories, but it seems there is a glaring lack of anger toward the parents of those doing the bullying. While parents are rewarding their kids for making the team, scoring the goal or making the grade, they seem to be neglecting their kids’ character development. Being kind is something any child can learn to do well. From the time a child is crawling around and stealing toys from their siblings, we can teach them kindness and empathy. Instead of finding the quickest way to stop the screaming and fighting amongst siblings, we have to take some time to teach basic principles like the Golden Rule. What will you spend time teaching your children? Do you want a baby genius who knows Mozart and flash cards or one that is kind, disciplined and secure enough to consider other people’s feelings. Your child knows without you having to tell them what you want them to learn most. No parent sits their child down and says, “Now Sweetie, I want you to remember that you are the most important person in the world. Be sure to make any kid that forgets this very miserable.” Unfortunately for us, it is a monkey-see-monkey-do situation that will lead to your kid being a problem or the solution. 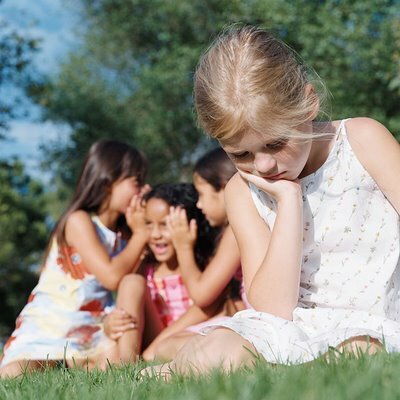 Watch for signs of bullying in their close friends, their not-so-close friends or even in the TV shows they watch. Kids who are bullied at home by an older sibling tend to act out on kids at school. Too many parents consider teasing and being mean a normal part of sibling behavior. It should not be tolerated toward anyone. If you wouldn’t allow them to do it to their friends, then they shouldn’t be allowed to do it to their siblings. Period. Be clear with them that bullying is not limited to punching and fighting. Whispering while glaring, calling names and harmfully excluding other children are more subtle ways of being unkind, but they are unkind and unacceptable. What’s worse, some kids are allowed to bully their parents. Is your kid running the show at your house? Are you afraid to confront your own child for fear of some sort of punishing emotional response? Are peace and happiness more important to you than raising a really great kid? All these conditions are perfect for a little tyrant to stage a coup you won’t even notice until it’s too late. If you find yourself refraining from making your child do what you want for fear she will scream or throw a tantrum, you are raising a bully. If you look the other way when you know your kid is lying, you are giving too much power to a tiny person, and you know what they say about absolute power. You must call a kid out on their junk or they will use it against you and then others. I shudder at the thought of having a son that everyone is afraid of or a daughter that everyone avoids. Take a good look at the child you are raising. Especially if that child is athletic, popular, or even bigger than all the other kids. Let’s face it, you know if your child has some social or physical power. There should be a strict, zero-tolerance policy for any behavior that comes anywhere close to bullying. Listen in when they are in earshot. Do they use any type of slurs or slang that targets one group or one person? Do you keep hearing the same name ridiculed in conversations between your kid and his or her friends? If so, it is time to bring the hammer down with the same consequences you would use if he or she were failing a class. You might find your child is the ringleader or you might find a peer pressure situation that needs to be rooted out. Don’t be too quick to defend your child if he or she is called out for bad behavior. Too many bullies find shelter in the arms of their doting parents. I once read about a teacher who was asked about the biggest difference between the beginning of his thirty-year career and the end. He said he used to be able to control the behavior of his students with a mere mention of calling their parents. After thirty years, he would find himself threatened by students with a call to their parents. What a sad change in the system when the disciplinarians become blind advocates. I know my generation suffered from a punish-now-ask-questions-never type of discipline, but we have gone beyond over compensating for this with our children. Whatever your beliefs or background, we all want kind children. We want them to be the kid who stands up to the bully in the bathroom or on the playground. We have learned the hard way that the issue of bullying is extremely high-stakes. The kindness of your child could be the lifeline that a bullied child needs to see hope in a cruel world. If your child has any social standing at all, hold him or her to a high standard of behavior. One great kid can set the tone and lead the way with proper guidance from a great parent. If your child is following Christ’s example, compassion and love and bravery are the standard. It’s not right to teach our kids that God works in the lives of adults only. Encourage them to exercise their faith in real ways that show the love of Jesus to everyone, even when it is tough. Their Heavenly Father has their back, as always. This entry was posted in bullying and tagged bullying, parenting a bullied child, parents of bullies by lookmom. Bookmark the permalink.